macOS uses keychains to help you keep track of and protect the passwords, account numbers, and other confidential information you use every day on your Mac computers and iOS devices. You can use the Keychain Access app on your Mac to view and manage your keychains. When you use iCloud Keychain, you can keep your passwords and other secure information updated across your devices. A keychain is an encrypted container that securely stores your account names and passwords for your Mac, apps, servers, and websites, and confidential information, such as credit card numbers or bank account PIN numbers. When you access a website, email account, network server, or other password-protected item, you can choose to save the password in your keychain so you don’t have to remember or enter the password each time. Each user on a Mac has a login keychain. The password for your login keychain matches the password you use to log in to your Mac. 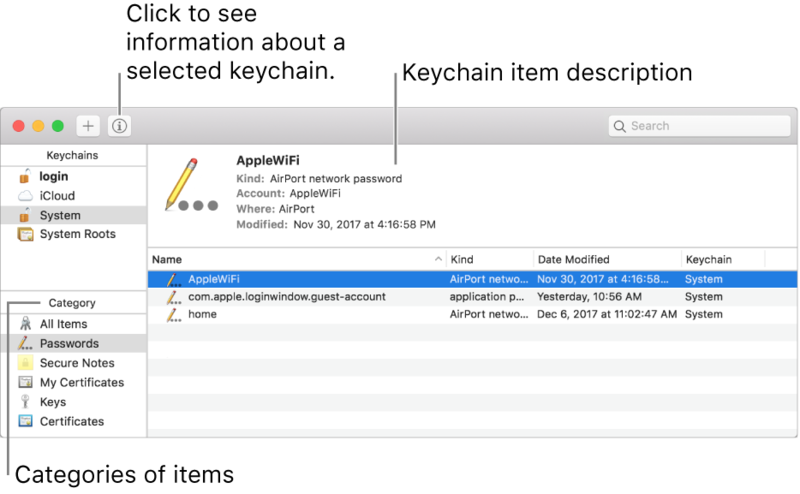 If an administrator on your Mac resets your login password, you’ll need to reset your login keychain password. You use the Keychain Access app on your Mac to view and manage your login and other keychains, and also the items securely stored in the keychains—for example, keys, certificates, passwords, account information, and notes. If you forget a password, you can find it in Keychain Access. Learn more about Keychain Access. If you use iCloud, you can have iCloud Keychain securely store the website login information and credit card information you use with AutoFill in Safari, and your Wi-Fi network information. iCloud Keychain automatically keeps that information up to date across all your Mac computers and iOS devices. iCloud Keychain also stores login information for the accounts you use in Mail, Contacts, Calendar, and Messages so it’s available on all your devices. Learn more about iCloud Keychain. Tip: When you use passwords and credit cards online, you can let Safari store them in your keychain and automatically fill them in for you. If you also use iCloud Keychain on your Mac and iOS devices, Safari can fill in the stored information on any of your devices. See AutoFill credit cards, contacts, and passwords.